Marauders prefer to get mixed up in a melee, weapons in hand, smashing and slashing their way through. Marauders are tough - probably the toughest combatants in any conflict. They tend to take a great deal of punishment while dealing out far more to any who dare go against them. 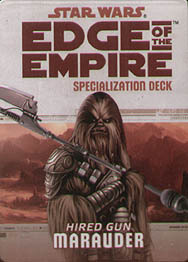 This deck requires the Edge of the Empire Core Rulebook and includes cards for all 20 talents available in the Marauder specialization.